Friday 27th July 2012. A date to remember. It has been a fifty-four year wait for London and now the Olympic opening ceremony is only hours away; the world waits in anticipation for the greatest sporting spectacle of all. If you are one of the many fans hoping for time to pass quickly so that the ceremony can begin, here’s a story to inspire you all. When I sat down to watch The Athlete (2009), a film that depicts the life of the Ethiopian marathon runner Abebe Bikila, I knew that the two-time Olympic gold medalist would have an incredible sporting story to tell but his remarkable personal tale should inspire us all. When an Olympic film comes out of Hollywood, the uplifting soundtrack, exaggerated highs and lows, and expectations of a whole nation are always trademark features. In Davey Frankel’s film though, the story is more subtle. Rather than showing Bikila’s defining Olympic moment in Rome 1960, the film is a reminiscent tale that depicts a comparatively low-key period in the runner’s career. Bikila is already a two-time Olympic gold medalist but has recently lost at the Mexico City Olympics in 1968. He is barely being considered for the following games in Munich. It is during this lull in Bikila’s career that the audience is taken back, with real footage, to his astonishing barefooted victory in Rome 1960. 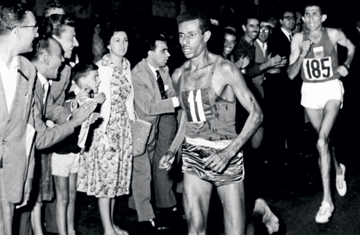 Having been a last minute replacement in the Ethiopian team, Bikila could not race in the shoes that he had been given. They were painful to wear and so he stepped up to the starting line as the only barefooted athlete. The world was stunned as he raced to victory with a world record time of 2:15:16 . This victory was significant for spectators back home, as Bikila won Ethiopia’s first Olympic medal in the nation that had conquered their own only 24 years earlier. He was also the first African athlete to win an Olympic marathon. “I wanted the world to know that my country, Ethiopia, has always won with determination and heroism” Abebe Bikila in Rome 1960. However, the film’s audience is not introduced to a jubilant Olympic athlete but instead a man that is fighting a personal struggle to compete again. This is what makes The Athlete (2009) stand out. The film gives an honest reflection of the personal drive of an athlete in competition. Of course, they are aware and proud of competing for their country but athletes have a selfish will to win. In this way, his struggle to compete in Munich is one that many athletes who compete at these high profile events must go through. They want to win, not for their nation but to fulfil their personal ambition and this should be respected. Nothing reflects the spirit of Abele Bikila more than his reaction to his car crash. Now paralysed, his ambition to compete again does not waver. Confined to a wheelchair, Bikila is determined to recover. During this time we are shown images from his second Olympic title, which makes his story even more astonishing. He was the first man to retain a marathon title in Tokyo 1964 and managed to do so after recovering from surgery of the appendix just weeks before the event. It was here that he cemented his status as an Olympic legend. The film shows Bikila as a true symbol of courage and determination before his death in 1973. It is a poignant scene when he competes for one last time as a para-athletic competitor in Norway 1970. Abebe Bikila will long be remembered as one of the greatest marathon runners of all time and has influenced many of the African athletes that race today. The film is an understated tribute to the man that helped to inspire a new generation of marathon runners. Perfect viewing for anyone wanting to capture the Olympic spirit.